I know nothing about the war for Mexican independence, so I can only take this film as documentarian fact! With that in mind, here's my sum up of how Mexico won its independence: Sisters that use ancient magick killed the Spanish with zombies of their own men. They then used the treasure of gigantic coins that are the size of my head to establish a government and make a rad flag with an eagle giving no fucks as it sits on a cactus and devours a snake. I someday dream we will have a flag that cool. Way to lame it out, Betsy Ross! 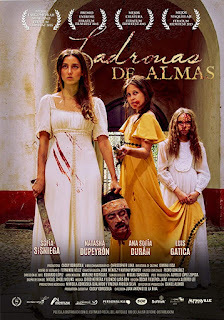 I gave a bunch away there, but Ladronas de Almas takes place on a villa in Mexico. A group of shady men claiming to be rebels roll up and ask for shelter when in truth they're looking for the lost treasure that was carried by missing Spanish soldiers. When men start vanishing these "rebels" show their true colors only to have to fight off some pretty badass sisters and zombies of dead generals. This film is a series of peaks and valleys for me. The overall story was interesting enough to keep me present in the film, but there is an over abundance of time spent focusing on the faux rebels. I would have liked to have seen a bit more about the sisters and their magick practice. Maybe they were playing it safe so that when the intensity of the sisters is revealed it hits harder, in which case I have no room to complain because they come out swinging when the turn happens. The zombies in this film are a good mix of the Haitian vodou zombie and the standard horror film zombie. We have a creature that maintains some sense of identity and reasoning all while being a reanimated corpse. You don't see a zombie throwing counters and blocks too often on celluloid so it was a good switch-up. All in all, if you're tired of the zombie wave that crashed long ago, then this isn't for you. If you want something a little bit different, and don't mind subtitles, give this a shot.